What is My DSO Manager? 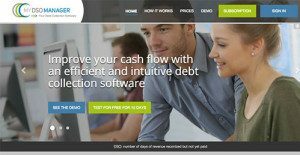 My DSO Manager is an intuitive and efficient debt collection software that you can use to improve your cash flow. It offers a robust set of tools to help your company recover its receivables faster. The app provides access to a wide range of innovative features such as interactive emails and automatic reminders as well as enables mobile access. The pricing is affordable and you can test drive the app’s features by subscribing to the free trial. My DSO Manager is an efficient and intuitive debt collection software available online. This software helps SMEs to big accounts to improve cash and working capital. It can be used very easily by all sizes of companies. My DSO Manager can be used quickly without long implementation phase. It is affordable for all sizes of companies with a pricing starting at 29€ per month for small businesses. My DSO Manager is an innovative debt collection software that is easy to use and implement. It includes strong credit management features with a scoring and credit limit set up tools. All debt collection module is powerful with the ability to set several collection scenarios depending on customer type. Dunning emails become interactive as the debtor can answer and comment through his dedicated page in My DSO Manager. Upload of customer data and receivable data is also easy with the app’s Smart upload module and connectors with other software like Salesforce and Quickbooks. Once account is created, users can work immediately on their collection diary. Pricing offers are affordable for all sizes of businesses. What Problems Will My DSO Manager Solve? 1. Cash issues due to late payments from customers: My DSO Manager helps to organize cash collection, track all history, monitor priorities, and adapt collection practices according to the customer. Improvement of cash is the first result of My DSO Manager. 2. Invoices not paid due to unresolved disputes: Dispute management process ensures that problems are identified early and settled as quickly as possible through the disputes follow up and disputes reports. That improves cash and customer satisfaction. 3. Losses due to bad debts: The software includes credit risk management features that help to monitor credit risk and to avoid unpaid invoices. There are well-liked and widely used solutions in each software category. But are they automatically the best fit for your organization’s special requirements? A market-leading software product may have thousands of subscribers, but does it offer what you need? For this reason, do not blindly invest in popular systems. Read at least a few My DSO Manager reviews and mull over the elements that you want in the software such as the price, main functionality, available integrations etc. Then, shortlist a few solutions that fit your needs. Try out the free trials of these products, read online reviews, get clarifications from the seller, and do your research meticulously. This exhaustive groundwork is certain to assist you choose the best software platform for your firm’s specific wants. How Much Does My DSO Manager Cost? If you need support for more than 4000 open items you should contact the vendor for a quote. We realize that when you make a decision to buy Accounting Software it’s important not only to see how experts evaluate it in their reviews, but also to find out if the real people and companies that buy it are actually satisfied with the product. That’s why we’ve created our behavior-based Customer Satisfaction Algorithm™ that gathers customer reviews, comments and My DSO Manager reviews across a wide range of social media sites. The data is then presented in an easy to digest form showing how many people had positive and negative experience with My DSO Manager. With that information at hand you should be equipped to make an informed buying decision that you won’t regret. What are My DSO Manager pricing details? What integrations are available for My DSO Manager? Contact the company directly to learn more on how to integrate My DSO Manager with your CRM or accounting software. If you need more information about My DSO Manager or you simply have a question let us know what you need and we’ll forward your request directly to the vendor.